Express self-love and self-respect by lovingly anointing yourself from head to toe with warm oil. This practice is called Abhyanga. A daily Abyanga practice restores the balance of the doshas and enhances well-being and longevity. 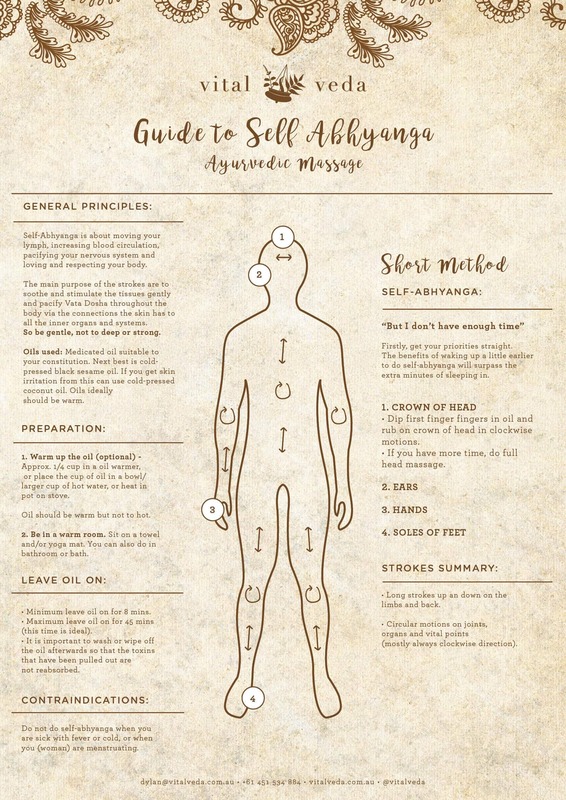 Regular Abyanga is especially grounding and relaxing for the Vata dosha, but everyone substantially benefits from this practice. Best oil to use is medicated oils specific to your individual constitution and the season. Next best is cold-pressed, black sesame oil, as it can most effectively penetrate the body. Rather use cold-pressed coconut oil in some Pitta imbalances, hot climates, and if the person has skin reaction to the sesame oil. Contact Us to order medicated oils. The main purpose of the strokes is to soothe and stimulate the tissues gently and pacify Vata Dosha throughout the body via the connections the skin has to all the inner organs and systems. So be gentle, not to deep or strong. (Studies actually show light touch is more effective than deep pressure massage for the nervous system. See Light Touch vs. Deep Pressure Massage). Leaving oil on - Aim to leave to oil on for at least 15-20 mins, and up to 45 mins (this time is ideal) at the most. Minimum leave oil on for 8 mins. Washing oil off/bathing - It is very important to wash, or wipe off the oil afterwards so that the toxins that have been pulled out are not reabsorbed. For this reason, leave the oil on for no longer then 1 hour. Caution - Do not do abhyanga or Nasya when you are sick with fever, or when woman are menstruating. Enjoy the nourishment you provided to your body, mind, and spirit, and carry that with you throughout your day! you sure will feel it! Our medicated oils contain complex and precious formulations of a vast range of organic, wild crafted and rare herbs. 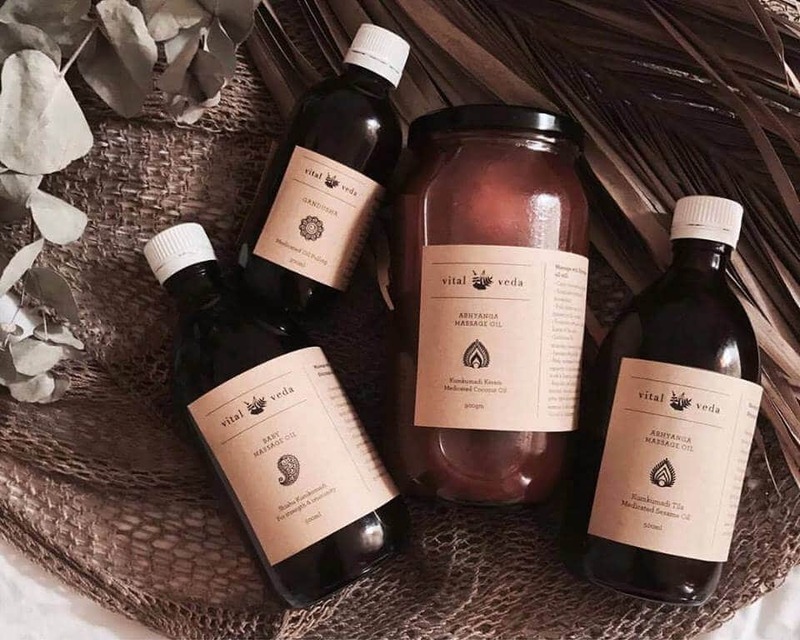 Dylan Smith (founder of Vital Veda) will impregnate rare and precious Raju family herbs into organic oils in a cultivated and attentive process that is coordinated with the cycles of the sun and moon. Available for purchase via postage or pick up from Bondi clinic. Email to order.